Ciro’s Landscaping, Inc. is a family-owned and operated full-service landscape design company that has been serving San Diego and Riverside counties since 1980. Ciro’s Landscaping provides all phases of custom design and installation for residential clients, as well as commercial developers and home-builders. The success of Ciro’s is due in part to a three-step philosophy —identify the needs of the client, fulfill those needs and provide great service. 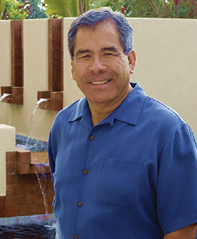 Delgadillo and his team view the landscape profession as an opportunity to discover new ways of improving and maximizing the usefulness of outdoor living spaces while also making them more beautiful. Ciro’s has stepped up the design approach. The landscape design team works one-on-one with clients from start to finish, beginning with site analysis. After this thorough evaluation, a site plan with detailed conceptual drawings is created to show clients beforehand exactly what the final project will look like. Landscape build/design for residential construction is the focus of Ciro’s Landscaping. The company specializes in outdoor installation of hardscapes such as stone and tile work, fireplaces, built-in barbecues, fire pits, water features and swimming pools. Softscape specialties include irrigation system installation and plant installation. Ciro’s Landscaping Inc. is the recipient of numerous awards in “Excellence in Landscape Beautification” and Residential Design/ Build categories, both at the local and state levels. Ciro’s thrives on exceeding client expectations in customer service, project design and quality installation.